It’s rather pathetic really when you go your whole life without knowing much about a country that borders not only your country, but your state as well. I’m going to go out on a limb and guess that when it comes to Mexico, most Californians know that there’s Mexican food, an seasonal workforce, and Mariachis. That’s about where the “knowledge” stops and from that point onward, it’s mostly ignorance and confusing things that are Mexican with things that are Spanish. Some of us are better than others, but if there is one thing I was completely sure on, it was that they did not and could not grow wine in Mexico. Turns out I’m a wee bit stupid. There are actually multiple wine regions in Mexico. An Austrian cousin of mine happened to be in Baja California for a month or so and encountered the wine that’s grown there. She was even gracious enough to lug two bottles back up to “Alta California” for me to try. I was of course skeptical, but at the same time very curious to see how the wines were. 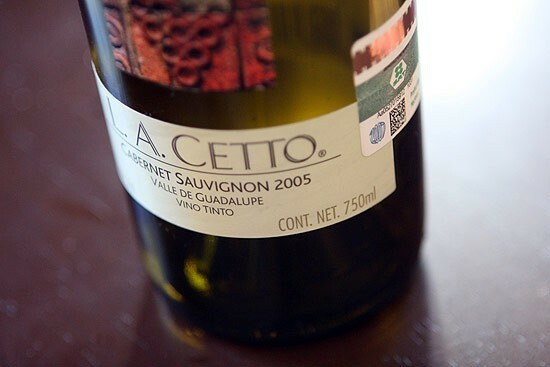 The wines she brought were a Vino Tinto (red blend) from Santo Tomas and a Cabernet Sauvignon from L.A. Cetto. Both were great. The Cab is about $8 from places where I could find it and I assume that the Tinto is a bit less. This puts them both in the excellent value range for my tastes. As to how they stack up, they have very well-developed noses. The Tinto had a few more complex aromas to it, although both were rather oaky. The bodies are light, slightly tannic, with minor berry flavors (more in the Cab than the Tinto), and even some very slight citric elements. They’re great drinking wines with food and I’m sure they would stack up quick well to anything spicy. If you see either of these makers, give them a try. It turns out that there’s imported to the US, although mostly in New York unfortunately. I’ve added them as possible contenders to choose from as I am pretty sick of how much California wines cost, yet I feel obligated to buy them as doing so reduces fuel consumption due to their not being shipped from another hemisphere.